We are only a "phone call or email" away for any advice or assistance with regard to any of our ranges or products. Our qualified personnel carry out all tasks in accordance with the latest European standards for safety and maintenance in-line with the manufacturer's recommendations to, ensure that the all items are kept in pristine operational condition. All of the options below are guidelines and can be personalised to suit our clients individual needs and requirements, the following are designed to make the, Inspection, Testing, and Maintenance of our products as simple as possible. Our trained staff are available 24/7 from our West Yorkshire base, to provide our clients with an efficient and reliable service when required. Gold Service: (Total care), Annual Testing & Quarterly Service Inspection and Repair, with emergency cover and Impress stock. To minimise any down time. 4 Scheduled visits per year. Silver Service: Annual Inspection and Repair. 1 Scheduled visit per year. Bronze Service: Maintenance and Repair cover. Agreed attendance times to cover any repairs. We can quote for any type of ladder maintenance, testing & inspection on clients own premises. Also offering various training courses in the various uses of different types and applications of ladder uses. All repairs and testing is done in line with the requirements of the EN standards and also the manufacturers guidelines. 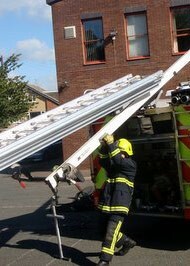 We provide Initial training free of charge for: Maintenance, Testing, Repairs & Use, following purchase of our ladders; within the UK. Additional training can be arranged, but may in some cases be chargeable. 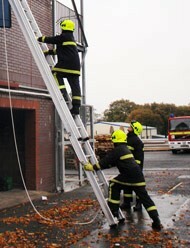 Ladder use (Fire Service level). A full range of spare parts is available from our West Yorkshire based premises, and can usually be delivered next day. Alternatively an Impress stock can be arranged, (this is provided with our Gold Care package). Total care: Cleaning, repair and inspection. (Varies for type of item). Managed Service: On individual items or full ensemble. We offer various options which can be tailored to suit individual user requirements on separate items of PPE to Full Fire Kit, covering; Inspections, Cleaning, Repair, Replacements, Upgrades, Identification and Tracking system. For full details on any of the above options, or to create your own plan please contact us. Offer training and support to all clients as required.